The diagnosis of pregnancy requires a multifaceted approach using 3 main diagnostic tools. These are history and physical examination, laboratory evaluation, and ultrasonography. Currently, physicians may use all of these tools to diagnose pregnancy at early gestation and to help rule out other pathologies. Pregnancy diagnosis. 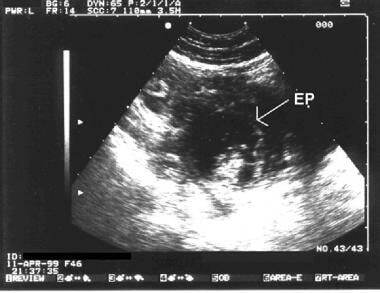 Sonogram showing a complex mass in the adnexa (labeled EP). It was found to be an ectopic pregnancy at the time of surgery. Other historical factors related to ectopic pregnancies include prior tubal manipulation, pelvic inflammatory disease, previous ectopic pregnancy, tubal disease, use of an intrauterine device for contraception, fertility therapies, and tubal ligation. [3, 5, 6] See Ectopic Pregnancy for a full description and details. The classic presentation of pregnancy is a woman with menses of regular frequency who presents with amenorrhea, nausea, vomiting, generalized malaise, and breast tenderness. Several hormones can be measured and monitored to aid in the diagnosis of pregnancy. The most commonly used assays are for the beta subunit of hCG. Other hormones that have been used include progesterone and early pregnancy factor. The cytotrophoblast and syncytiotrophoblast each secrete a variety of hormones that include, but are not limited to, corticotropin-releasing hormone, gonadotropin-releasing hormone, thyrotropin-releasing hormone, somatostatin, corticotropin, human chorionic thyrotropin, human placental lactogen, inhibin/activin, transforming growth factor-beta, insulinlike growth factors 1 and 2, epidermal growth factor, pregnancy-specific beta-1 glycoprotein, placental protein 5, and pregnancy-associated plasma protein-A. To date, no commercially feasible tests that use these hormones have been made available to aid in the diagnosis of pregnancy. hCG is a glycoprotein similar in structure to follicle-stimulating hormone (FSH), luteinizing hormone (LH), and thyrotropin. hCG is composed of alpha and beta subunits. The alpha subunit of hCG is similar to the alpha subunit of FSH, LH, and thyrotropin. The free beta subunit of hCG differs from the others in that it has a 30–amino acid tailpiece at the COOH terminus. Free beta subunits are degraded by macrophage enzymes in the kidney to make a beta subunit core fragment, which is primarily detected in urine samples. The beta-hCG subunit is present in the syncytial layer of the blastomere. Hyperglycosylated hCG is a form of hCG produced by invasive cytotrophoblast cells in early pregnancy and implantation. hCG messenger RNA is detectable in the blastomeres of 6- to 8-cell embryos at 2 days but cannot be isolated in culture medium until 6 days. Detection in maternal serum and urine is evident only after implantation and vascular communication has been established with the decidua by the syncytiotrophoblast 8-10 days after conception. hCG is present in the maternal circulation as either an intact dimer, alpha or beta subunit, and degraded form, or beta core fragment. Intact and free beta subunit are initially the predominant forms of hCG, with the beta core fragment emerging as the predominant form in the fifth week after conception. Additionally, intact and free beta subunit have the most day-to-day variability and are transiently undetectable even 10 days after detection of pregnancy. Optimally, tests used for early pregnancy detection should be able to recognize all forms of intact hCG, including the free beta subunit and the beta core fragment. Currently, 4 main hCG assays are used: (1) radioimmunoassay, (2) immunoradiometric assay, (3) enzyme-linked immunosorbent assay (ELISA), and (4) fluoroimmunoassay. These assays are highly specific for hCG with antibodies directed against 2 or more isotopes on the intact hCG molecule. Time of detection is related to the sensitivity of the assay being used. Most current pregnancy tests have sensitivity to approximately 25 mIU/mL. Urine devices must be formulated to detect hyperglycosylated hCG, which is the key molecule in early pregnancy. Dimeric hCG and both the alpha and beta subunits are produced in the pituitary gland of nonpregnant females and are released in association with LH. Although levels are much higher in postmenopausal women (110 pg/mL vs 10 pg/mL), they are still below the sensitivity of the most sensitive clinical assays (approximately 1 mIU/mL) used in pregnancy monitoring. hCG is detectable in the serum of approximately 5% of patients 8 days after conception and in more than 98% of patients by day 11. At 4 weeks' gestation (18-22 d postconception), the dimer and beta subunit hCG doubling times are approximately 2.2 days (standard deviation ± 0.8 d) and fall to 3.5 days (standard deviation ± 1.2 d) by 9 weeks' gestation. levels peak at 10-12 weeks' gestation and then begin to decline rapidly until another, more gradual rise begins at 22 weeks' gestation, which continues until term. The initial rate of rise, measured by serial quantitative hCG testing, is important in the monitoring of early complicated pregnancies that have yet to be documented as viable and/or intrauterine. Failure to achieve the projected rate of rise may suggest an ectopic pregnancy or spontaneous abortion. hCG doubling times are subject to fluctuations of intact hCG during early pregnancy, so interpretation of these values must take into account the assays used and the clinical picture. In one study, 200 women who received a diagnosis of ectopic pregnancy by serial hCG were evaluated. Of no surprise, the rise in hCG values in women with ectopic pregnancies was slower than those with viable pregnancies and the decline of hCG values in women with ectopic pregnancies was slower than for those with completed spontaneous abortion. However, 20.8% of women with ectopic pregnancies presented with a rise in hCG values similar to the minimal rise for women with a viable gestation, and 8% of women presented with a fall in hCG values similar to women with a completed spontaneous abortion. Several over studies such as this one demonstrate that a single pattern of hCG does not exist for abnormal early pregnancy, so caution must be taken in interpreting serial hCG values in the evaluation of early pregnancy. On the other hand, an abnormally high level or accelerated rise can prompt investigation into the possibility of molar pregnancy, multiple gestations, or chromosomal abnormalities. As with most tests, hCG test results can be either falsely negative or positive. The prevalence of false-positive serum hCG results is low, with estimates ranging from 0.01-2%. False-positive serum hCG results are usually due to interference by non-hCG substances or the detection of pituitary hCG. Some examples of non-hCG substances that can cause false-positive results include human LH, antianimal immunoglobulin antibodies, rheumatoid factor, heterophile antibodies, and binding proteins. Most false-positive results are characterized by serum levels that are generally less than 1000 mIU/mL and usually less than 150 mIU/mL. The median serum concentration for patients with false-positive results reported to the Food and Drug Administration (FDA) from 1985-2001 is 75 mIU/mL. Also, note that only 2 (0.74%) of 271 separate hCG determinations in undiluted sera in both the FDA database and the literature were greater than 1000 mIU/mL. Several methods are available to help detect false-positive serum hCG results. The first step is to check urine hCG levels. The free beta-hCG subunit is further degraded in the kidney to a beta subunit core fragment that has less than half the molecular weight of the free beta subunit. Some of the substances that can cause serum false-positive results have much higher molecular weights that are not easily filtered through the renal glomeruli; therefore, they do not produce a positive urine hCG result. Other steps to verify or disprove a positive serum hCG result include retesting the same specimen, testing a new specimen, taking serial measurements to look for a rise, performing serial dilutions to look for linearity, and testing using a different method. False-negative hCG test results usually involve urine and are due to the qualitative nature of the test. Reasons for a negative test result may include an hCG concentration below the sensitivity threshold of the specific test being used, a miscalculation in the onset of the missed menses, or delayed menses from early pregnancy loss. Delayed ovulation or delayed implantation are other reasons for low hCG concentrations at the time of testing, which yields a false-negative result. At least 1 case report in the literature is notable when considering false-negative urine hCG test results. A 37-year-old woman presented to an emergency department in hypovolemic shock 13 weeks after her last menstrual period. She had a dilation and curettage for an intrauterine pregnancy 8 weeks before presentation. Two different samples yielded negative qualitative urine pregnancy test results. The third urine hCG test result was weakly positive, and, at that time, her serum hCG level was 22,430 mIU/mL. She was diagnosed with an interstitial ectopic pregnancy and underwent surgery, during which approximately 2000 mL of free blood was found in her peritoneal cavity. Interstitial pregnancies make up less than 3% of tubal pregnancies, but they can be present in conjunction with negative urine pregnancy test results. Viable intrauterine pregnancy can be diagnosed with 97.5% sensitivity if the serum progesterone levels are greater than 25 ng/mL (>79.5 nmol/L). Conversely, finding serum progesterone levels of less than 5 ng/mL (< 15.9 nmol/L) can aid in the diagnosis of a nonviable pregnancy with 100% sensitivity. Finding serum progesterone levels of less than 5 ng/mL allows diagnostic evaluation of the uterus in a stable patient, even if an ectopic pregnancy cannot be distinguished from a spontaneous intrauterine abortion beforehand. In the event that the serum progesterone level is 5-25 ng/mL, further testing using US, additional hormonal assays, or serial examinations is warranted to establish the viability of the pregnancy. Algorithms using serum progesterone are available for the evaluation and management of patients with abnormal early pregnancy. The early pregnancy factor (EPF) assay may be useful in the future. EPF is a poorly defined immunosuppressive protein that has been isolated in maternal serum shortly after conception and is the earliest available marker to indicate fertilization. It is detectable in the serum 36-48 hours after fertilization, peaks early in the first trimester, and is almost undetectable at term. EPF also appears within 48 hours of successful in vitro fertilization embryo transfers. EPF cannot be detected 24 hours after delivery or at the termination of an ectopic or intrauterine pregnancy. EPF is also undetectable in many ectopic pregnancies and spontaneous abortions, indicating that an inability to identify EPF during pregnancy heralds a poor prognosis. EPF has limited clinical applications at this time because the molecule is difficult to isolate. Detection of EPF currently relies on a complex and unwieldy assay termed the rosette inhibition test. EPF may play a more prominent role in the future as the diagnosis of conception prior to implantation elucidates new strategies for contraception, highly accurate dating, and advanced genetic studies. At least 25 different home pregnancy tests are currently marketed in the United States. These tests now use the modern immunometric assay. Most of these tests claim "99% accuracy" or some other similar statements on the packaging or product insert. Most of the tests also now advertise that they can be used "as early as the day of the missed menstrual period." Several home pregnancy tests actually instruct that they may be used 3-4 days before the time of the missed period. The accuracy claims are derived from an FDA guideline that refers to the test's ability to identify approximately 100 nonpregnant urine samples supplemented with intact hCG from a similar number of urine samples not supplemented with hCG. The broad 99%-accuracy statement is made for tests with sensitivities for hCG concentrations ranging from 25 mIU/mL (fairly sensitive) to tests with sensitivities of 100 mIU/mL (less sensitive). The 99%-accuracy statement in reference to the FDA guideline is misleading in that it has no bearing on the ability of the home pregnancy test to detect early pregnancy. Home pregnancy tests are most commonly used in the week after the missed menstrual period (fourth completed gestational week). Urine hCG values are extremely variable at this time and can range from 12 mIU/mL to greater than 2500 mIU/mL. This variability continues into the fifth week, when values have been shown to range from 13 mIU/mL to greater than 6000 mIU/mL. Both weeks have a percentage of urine hCG values that is below the sensitivities of detection for common home pregnancy tests (range 25-100 mIU/mL). Several studies have tested different home pregnancy tests for sensitivity and accuracy claims. One study tested 18 different home pregnancy tests at 5 different hCG concentrations (0, 12.5, 25, 50, and 100 mIU/mL). No difference in sensitivity was detected between tests that had longer reading times (usually approximately 5 min) compared with those with shorter reading times (1 min). Clearly positive results were only found in 44% of the brands when tested at the highest hCG concentration (100 mIU/mL). The sensitivity was improved to 83% of brands tested at 100 mIU/mL when a faintly discernible line was also considered a positive result. Test sensitivity was also increased when reading times were extended to 10 minutes. Overall, 100% accuracy was only achieved in all 18 brands tested when the highest hCG concentration (100 mIU/ml) was used, an extended reading time was used, and faintly discernible results were included as positive. Another study evaluated 7 home pregnancy tests and found that despite the claims, the detection of pregnancy on the day of missed period varied from 16-95%, and some devices were faulty (defined as devices failing to yield a band in the control window). Other studies have found that home pregnancy tests with digital reading may offer significant benefits over traditional nondigital tests. The limitations of these tests must be understood so that pregnancy detection is not significantly delayed. Early pregnancy detection allows for the commencement of prenatal care, potential medication changes, lifestyle changes to promote a healthy pregnancy (appropriate diet; avoidance of alcohol, tobacco, and certain medications), or early pregnancy termination if desired. Therefore, in this particular population, quantitative assay results can be used to guide counseling and further evaluation. TVUS has several advantages over TAUS during early pregnancy. TVUS can help detect signs of intrauterine pregnancy approximately 1 week earlier than TAUS. Patients are not required to have a full bladder and are not required to endure uncomfortable pressure on the abdominal wall from the external probe. TVUS is also better for patients who are obese or those who guard during TAUS. One disadvantage is that some patients are anxious about the transvaginal probe and may object to its insertion. Vaginal probes are typically of higher frequency (5-8 MHz) than abdominal probes (3-5 MHz). The higher frequency allows for better resolution of the image but less penetration of the signal. Also, practice is necessary for familiarization with the orientation on the US monitor when performing TVUS. The earliest structure identified is the gestational sac (GS). The GS can be seen on TVUS images by 4-5 weeks' gestation and grows at a rate of 1 mm/d in early gestation. By 5.5-6 weeks' gestation, a double-decidual sign can be seen, which is the GS surrounded by the thickened decidua. The presence of an early GS can be confused with a small collection of fluid or blood or the pseudo GS of an ectopic pregnancy. Because of this, the diagnosis of intrauterine pregnancy should not be made on the basis of visualization of the GS alone. The yolk sac can be recognized by 4-5 weeks' gestation and is seen until approximately 10 weeks' gestation. The yolk sac is a small sphere with a hypoechoic center and is located within the GS (see the image below). Pregnancy diagnosis. 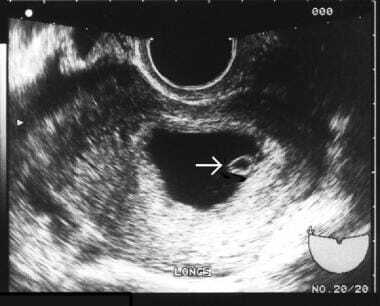 The arrow is pointing to the yolk sac as seen within the gestational sac (GS). The yolk sac is usually identified before the GS is larger than 10 mm. Likewise, if the yolk sac is larger than 7 mm without signs of a developing fetal pole, the chance of an abnormal pregnancy is increased. Observing a GS that is larger 10 mm without a yolk sac is rare, and if this is observed, it most likely represents an abnormal pregnancy (see the image below). Pregnancy diagnosis. This is a gestational sac (GS) that measures approximately 2 X 3 cm, without evidence of a yolk sac. When the GS is larger than 10 mm and no yolk sac is identified, an abnormal pregnancy is likely. This particular situation is referred to as a blighted ovum or an anembryonic pregnancy. Likewise, a yolk sac larger than 7 mm without evidence of a developing fetal pole suggests a nonviable pregnancy. The diagnosis of intrauterine pregnancy can be made once the yolk sac is present, which also excludes ectopic pregnancy, except in the rare instance of heterotopic pregnancy. A heterotopic pregnancy, an intrauterine pregnancy, and an ectopic pregnancy during the same gestation was once thought to be extremely rare but has now been shown to be present in as many as 1 in 3000 pregnancies. The fetal or embryonic pole is first seen on TVUS images at approximately 5-6 weeks' gestation. It should always be seen by TVUS when the GS is larger than 18 mm or by TAUS when the GS is larger than 2.5 cm. The fetal pole is a linear hyperechoic structure that grows at approximately 1 mm/d. Cardiac motion can sometimes be identified in a 2- to 3-mm embryo but is almost always present when the embryo grows to 5 mm or longer. At 5-6 weeks' gestation, the fetal heart rate ranges from 100-115 beats per minute. The heart rate will steadily increase to a mean of 140 beats per minute by 9 weeks' gestational age. Ultrasonography becomes even more useful for the diagnosis of early pregnancy and for identifying abnormal pregnancies when it is used in conjunction with assessing quantitative hCG levels. The identification of gestational structures by ultrasonography correlates with specific levels of hCG, termed discriminatory levels. A discriminatory level is the level of hCG at which the structure in question should always be identified in a normal, singleton, intrauterine pregnancy. The GS has been identified by TVUS with hCG levels as low as 300 mIU/mL, and most experienced TVUS operators should visualize the GS when levels are approximately 1000 mIU/mL. The discriminatory level for the GS is approximately 3600 mIU/mL, and if it is not seen at this point, other pathology must be excluded. Many use a more conservative discriminatory level for the GS, at 2000 mIU/mL by TVUS and 3600 mIU/ml by TAUS, and will begin to rule out pathology if the GS is not seen. The adnexa should be scanned for an ectopic pregnancy, and sonograms and hCG levels should be followed until a diagnosis is made. Furthermore, one study showed that all viable intrauterine pregnancies had a GS identified by TAUS for hCG levels of greater than 6500 mIU/mL. Other structures are also anticipated in correlation with specific hCG levels. The yolk sac (see the image below) is commonly observed with an hCG level of approximately 2500 mIU/mL, although it may not be identified until levels are much higher. The embryonic pole usually becomes evident at a level of approximately 5000 mIU/mL, and the fetal heartbeat can be seen in the vast majority of normal gestations when the hCG level reaches 10,000 mIU/mL. The diagnosis of pregnancy can be made by several methods. Normocyclic women who present with amenorrhea and typical history and physical examination findings have the classic presentation and can be diagnosed with a viable intrauterine pregnancy if they progress appropriately. Currently, most women are diagnosed with pregnancy after a missed menstrual cycle and a positive urine or serum hCG finding. The pregnancy is diagnosed as viable with serial examinations and normal pregnancy development, a normal result after dating ultrasonography, or a positive finding of fetal heart tones using Doppler studies. Women who are considered high-risk or those who present with abdominal pain or vaginal bleeding in early gestation are more likely to be evaluated with ultrasonography and additional hormonal assays. A number of different combinations can aid in the diagnosis of a viable intrauterine pregnancy. The physician must ascertain what is most appropriate at the time of patient presentation. For excellent patient education resources, visit eMedicineHealth's Pregnancy Center. Also, see eMedicineHealth's patient education articles Home Pregnancy Test, Ectopic Pregnancy, Birth Control Overview, and Birth Control Methods. Paspulati RM, Bhatt S, Nour SG. 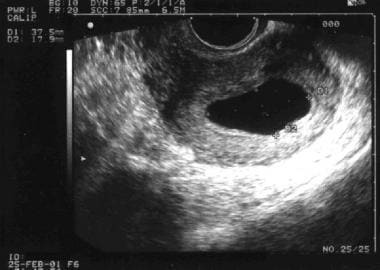 Sonographic evaluation of first-trimester bleeding. Radiol Clin North Am. 2004 Mar. 42(2):297-314. [Medline]. Dart RG. Role of pelvic ultrasonography in evaluation of symptomatic first-trimester pregnancy. Ann Emerg Med. 1999 Mar. 33(3):310-20. [Medline]. Seeber BE, Barnhart KT. Suspected ectopic pregnancy. Obstet Gynecol. February 2006. 107(2):399-413. [Medline]. Female Sterilization: Risk of Ectopic Pregnancy After Tubal Sterilization Fact Sheet. Centers for Disease Control and Prevention. 2008. Available at http://www.cdc.gov/reproductivehealth/UnintendedPregnancy/EctopicPreg_factsheet.htm. Speroff L, Fritz MA. Clinical Gynecologic Endocrinology and Infertility. 7th ed. Philadelphia, PA: Lippincott Williams & Wilkins; 2005. Berek JS, Adashi EY, Hillard PA. Novak's Gynecology. 14th. Baltimore, MD: Lippincott Williams & Wilkins; 2006. Paul M, Schaff E, Nichols M. The roles of clinical assessment, human chorionic gonadotropin assays, and ultrasonography in medical abortion practice. Am J Obstet Gynecol. 2000 Aug. 183(2 Suppl):S34-43. [Medline]. McChesney R, Wilcox AJ, O'Connor JF, et al. Intact HCG, free HCG beta subunit and HCG beta core fragment: longitudinal patterns in urine during early pregnancy. Hum Reprod. 2005 Apr. 20(4):928-35. [Medline]. Silva C, Sammel MD, Zhou L, et al. Human chorionic gonadotropin profile for women with ectopic pregnancy. Obstet Gynecol. 2006 Mar. 107(3):605-10. [Medline]. Olson TG, Barnes AA, King JK. Elevated hCG Outside of Pregnancy - Diagnostic Considerations and Laboratory Evaluation. Obstet Gynecol Survey. Oct 2007. 62(10):669-74. [Medline]. Valenzuela R, Iserson KV, Punguyire D. False-positive urine pregnancy tests - clinicians as detectives. Pan Afr Med J. 2011. 8:41. [Medline]. [Full Text]. Snyder JA, Haymond S, Parvin CA, et al. Diagnostic considerations in the measurement of human chorionic gonadotropin in aging women. Clin Chem. 2005 Oct. 51(10):1830-5. [Medline]. Davies S, Byrn F, Cole LA. Human chorionic gonadotropin testing for early pregnancy viability and complications. Clin Lab Med. 2003 Jun. 23(2):257-64, vii. [Medline]. Cole LA. The utility of six over-the-counter (home) pregnancy tests. Clin Chem Lab Med. 2011 Aug. 49(8):1317-22. [Medline]. Guth B, Hudelson J, Higbie J, et al. Predictive value of hCG level 14 days after embryo transfer. J Assist Reprod Genet. 1995 Jan. 12(1):13-4. [Medline]. Dart RG, Kaplan B, Cox C. Transvaginal ultrasound in patients with low beta-human chorionic gonadotropin values: how often is the study diagnostic?. Ann Emerg Med. 1997 Aug. 30(2):135-40. [Medline]. Ankum WM, Van der Veen F, Hamerlynck JV, et al. Suspected ectopic pregnancy. What to do when human chorionic gonadotropin levels are below the discriminatory zone. J Reprod Med. 1995 Jul. 40(7):525-8. [Medline]. Barnhart K, Esposito M, Coutifaris C. An update on the medical treatment of ectopic pregnancy. Obstet Gynecol Clin North Am. 2000 Sep. 27(3):653-67, viii. [Medline]. Barnhart KT, Sammel MD, Rinaudo PF, et al. Symptomatic patients with an early viable intrauterine pregnancy: HCG curves redefined. Obstet Gynecol. 2004 Jul. 104(1):50-5. [Medline]. Barnhart KT, Simhan H, Kamelle SA. Diagnostic accuracy of ultrasound above and below the beta-hCG discriminatory zone. Obstet Gynecol. 1999 Oct. 94(4):583-7. [Medline]. Braunstein GD. False-positive serum human chorionic gonadotropin results: causes, characteristics, and recognition. Am J Obstet Gynecol. 2002 Jul. 187(1):217-24. [Medline]. Bree RL, Edwards M, Bohm-Velez M, et al. Transvaginal sonography in the evaluation of normal early pregnancy: correlation with HCG level. AJR Am J Roentgenol. 1989 Jul. 153(1):75-9. [Medline]. Cole LA, Khanlian SA, Sutton JM, et al. Accuracy of home pregnancy tests at the time of missed menses. Am J Obstet Gynecol. 2004 Jan. 190(1):100-5. [Medline]. Cole LA, Sutton-Riley JM, Khanlian SA, et al. Sensitivity of over-the-counter pregnancy tests: comparison of utility and marketing messages. J Am Pharm Assoc (2003). 2005 Sep-Oct. 45(5):608-15. [Medline]. Goldstein SR, Snyder JR, Watson C, et al. Very early pregnancy detection with endovaginal ultrasound. Obstet Gynecol. 1988 Aug. 72(2):200-4. [Medline]. Kim SW, Ha YR, Chung SP, et al. Ruptured interstitial pregnancy presenting with negative beta-hCG and hypovolemic shock. Am J Emerg Med. 2003 Oct. 21(6):511. [Medline]. Moore KL, Persaud TVN. The Developing Human: Clinically Oriented Embryology. 5th ed. Philadelphia, Pa: WB Saunders; 1993. 14-69. Nyberg DA, Laing FC, Filly RA. Threatened abortion: sonographic distinction of normal and abnormal gestation sacs. Radiology. 1986 Feb. 158(2):397-400. [Medline]. Nyberg DA, Mack LA, Harvey D, et al. Value of the yolk sac in evaluating early pregnancies. J Ultrasound Med. 1988 Mar. 7(3):129-35. [Medline]. Romero R, Kadar N, Copel JA, et al. The value of serial human chorionic gonadotropin testing as a diagnostic tool in ectopic pregnancy. Am J Obstet Gynecol. 1986 Aug. 155(2):392-4. [Medline]. Timor-Tritsch IE, Yeh MN, Peisner DB, et al. The use of transvaginal ultrasonography in the diagnosis of ectopic pregnancy. Am J Obstet Gynecol. 1989 Jul. 161(1):157-61. [Medline]. Tomlinson C, Marshall J, Ellis JE. Comparison of accuracy and certainty of results of six home pregnancy tests available over-the-counter. Curr Med Res Opin. 2008 Jun. 24(6):1645-9. [Medline]. Practice Bulletin No. 175: Ultrasound in Pregnancy. Obstet Gynecol. 2016 Dec. 128 (6):e241-e256. [Medline]. The authors and editors of Medscape Reference gratefully acknowledge the contributions of previous authors Randle L Likes, DO and Eric Rittenhouse, MD, FACOG to the development and writing of this article.